We have been doing kirtan for SIX nights…and we’re only getting started! The 24 hours of kirtan begins Friday at 9 AM (EST USA). Come early to hear the morning lecture on how to absorb yourself in chanting the Holy Name. Then, there will be an invocation ceremony before 9 AM. Bada Haridas Prabhu will begin the kirtan in the tent setup outside. Bring your friends, family, and, of course, yourself to immerse your soul in the vibration of the Maha-Mantra. Hare Krishna! CLICK HERE to tune-in for the LIVE webcast. 1. Link to an audio recording of Chakrini Devi leading Hari Haraya Namaha prayers. 2. Link to an audio recording of Visvambhar Sheth leading a Hare Krishna Maha Mantra kirtan. 3. Link to an audio recording of Madhava dasa leading a Hare Krishna Maha Mantra kirtan. Thanks to Govinda Cordua for posting the audio recordings. Festival of the Holy Name! Link to an audio recording of Radhika dasi leading kirtan at Radha Govinda Mandir, Alachua, Florida. From Night 4, November 23rd. Link to an audio recording of Madhava dasa leading kirtan outside the homes of Govinda Syer and Tosan Krishna prabhus in Alachua, Florida. Thanks to Govinda Cordua for posting the recordings. Link to an audio recording of Anapayani dasi leading Damodarastakam prayers. Link to an extended audio recording of Madhava dasa leading a Hare Krishna Maha Mantra kirtan. For night 2, the last day of Kartik, please join the live kirtan webcast, from the ISKCON Alachua Temple Room, starting at 4:15 pm and again at 6:00 pm EST on Krishna.com. Festival of the Holy Name: 24 Hours Is Not Enough! Saturday, Nov. 20th: Kartik celebration and Bhajans at Ragunath and Yamuna’s house (possible bonfire). Sunday, Nov. 21st: Last day of Kartik with Bhajans at the Alachua Temple. Monday, Nov. 22nd: Bhajans at Nalinikantha and Ratnesvari’s house (Sri Sri Radha Govinda Mandir). Tuesday, Nov. 23rd: Bhajans at Toshan Krishna’s and Govinda Syer’s properties, with a bonfire. Wednesday, Nov. 24th: Gurukuli Bhajans at Govinda Romero’s house (previously the Girl’s Ashram). Thursday, Nov. 25th: Bhajans at the Temple for Thanksgiving (possible, not confirmed). Then of course the actual Festival of the Holy Name event with 24 hours of kirtan on Friday and Saturday, November 26th & 27th! 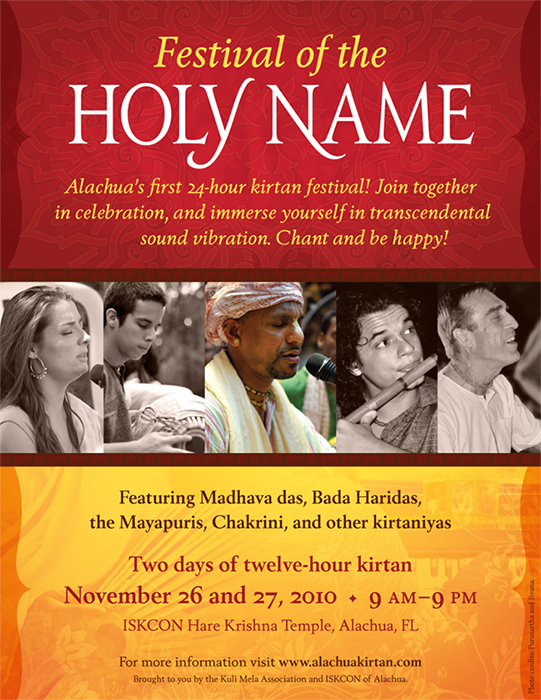 Festival of the Holy Name: Alachua’s first 24-hour kirtan festival! Join together in celebration and immerse yourself in transcendental sound vibration. Chant and be happy! Featuring Madhava dasa, Bada Haridas, the Mayapuris, Chakrini and other kirtaniyas. Join us for two days of twelve-hour kirtan. 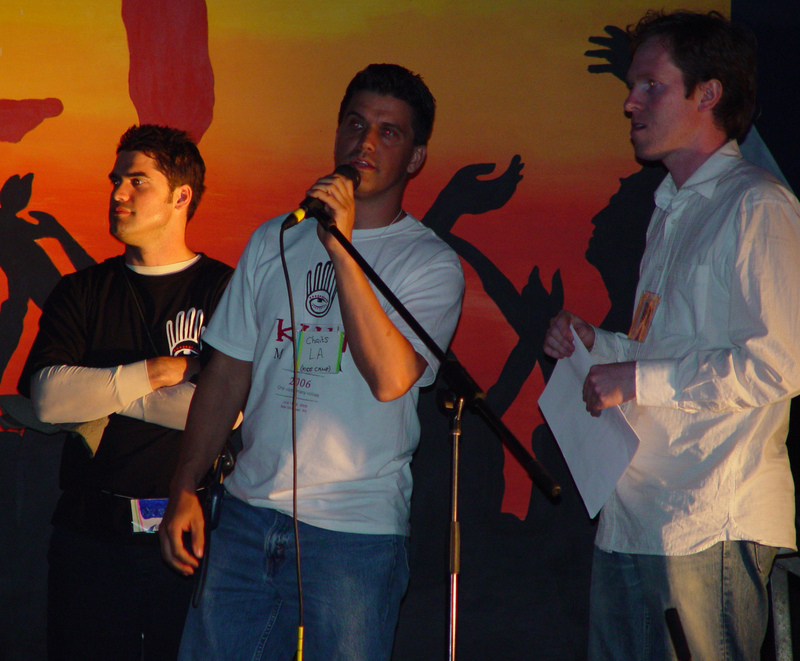 November 26 and November 27, 2010 — 9 AM to 9 PM (Thanksgiving weekend). ISKCON Alachua temple. Brought to you by the Kuli Mela Association and ISKCON of Alachua.